Home » Website Building » Weebly » How to Create Free Blog With Weebly? How to Create Free Blog With Weebly? Blog is a simple and powerful tool to attract more visitors to your site. It enables you to publish your content dynamically and allows to distribute latest blog post to subscribers in order to drive more traffic. Weebly offers blogging feature as part of its content management system, hence similar to content site creation you can use most of the Weebly elements in blog also. In this article we will discuss how to create a free blog with Weebly along with other blogging features. 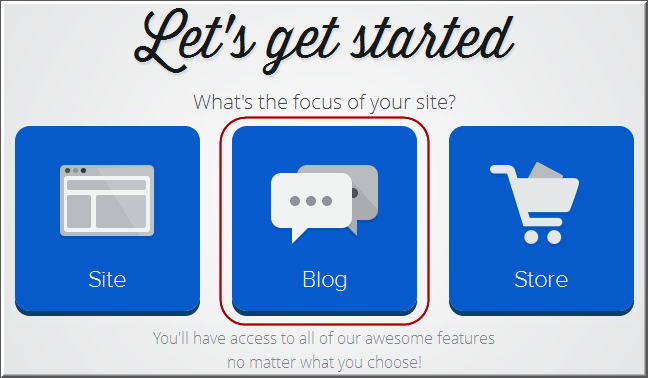 Learn more about creating a free site with Weebly. Login to your Weebly account and edit the site you want to add a blog. Under Pages tab click on “Add Page +” button and you will see many options for adding a webpage. Select “Blog Page” in order to add a blog to your site. Choose the desired page layout and that’s all a blog is added to your site. The blog page added will act as a index page for your blog featuring latest posts and you need to create individual blog posts using Weebly blog editor. The above way of adding a blog page will add blog to your content site. If you want to keep only a blog site then ensure to have the blog page as your home page. This can be done by moving the blog page to the first page under “Pages” menu and the home icon will be displayed next to the page name. For effective navigation, create additional “External Link” pages and link them to your blog categories. This way you can have a complete Weebly blog site. You can also create additional standard and store pages and show or hide it from the navigation menu. 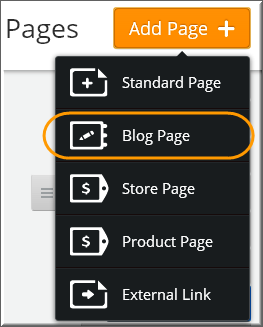 Once you added a blog page, you will see a different blog editor when editing a blog post. You can see three buttons at the bottom of a editor – Comments, Blog Settings and New Post. 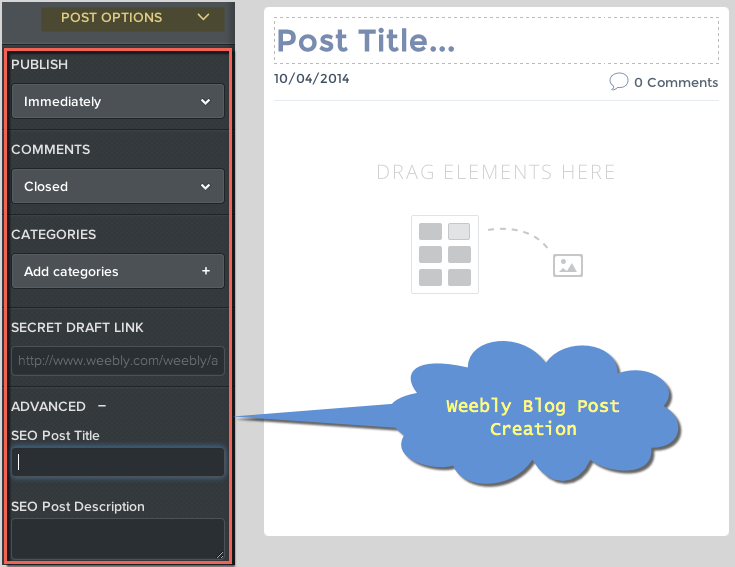 Click on the “New Post” button to see new set of elements appear in the Weebly Blog editor which you can drag and drop to your post’s content area. For example, there will be a “Read More Break” element which can be added to your blog post. The content before this element will be shown first and if an interested user clicks on “Read More” link then the complete post content will be displayed. This is a very useful feature especially for lengthy posts having lot of content. The following elements are grouped under “Blog Sidebar” which can only be added in the sidebar. This group will disappear when you are creating a blog post to prevent placing it in the blog content area. Learn more about Weebly blog elements. 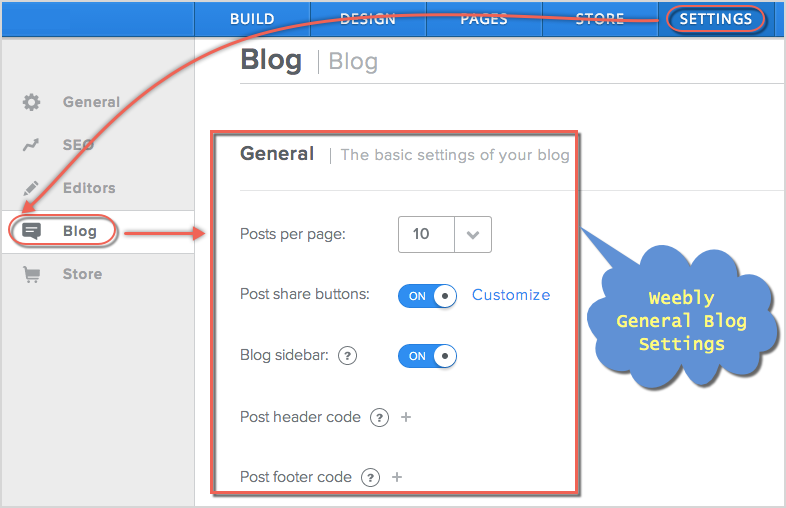 Click on the “New Post” button and drag and drop elements to start building your blog content. Your blog is always saved as a Draft and anytime you can retrieve it even if it is not published. Share your Weebly blog instantaneously with Facebook and Twitter by switching on the Sharing buttons. Create a Category for your topic by clicking “Add” in the categories section. You can add a single post into multiple categories. Set the comments to open or closed as you desire. Publish post immediately or on any defined scheduled time as per the time zone you selected under “Blog Settings > Date & Time”. Every blog post will be published as individual web page and will be listed in search engines. Before creating a post click on the “Blog Settings” option to setup various features like posts per page, share buttons for Facebook and Twitter, enable or disable sidebar and add header and footer code available under “General” section. Blog settings also includes various options for your comment settings like choosing default Weebly’s commenting system, disqus or Facebook and enabling CAPTCHA spam protection. 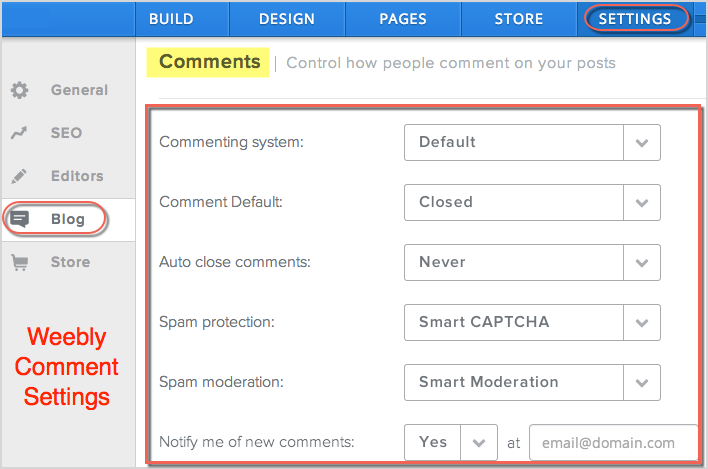 Clicking on “Comments” button will provide you many options for effective comment control for your blog. You can approve, delete or mark the comment as spam. Learn more about Weebly comment management. You also can create a blog when you create a new site by choosing the blog option. Nevertheless it will follow the same process as explained above besides allowing you to choose the theme.